Why Does Exterior Paint Peel? What is zero voc paint? 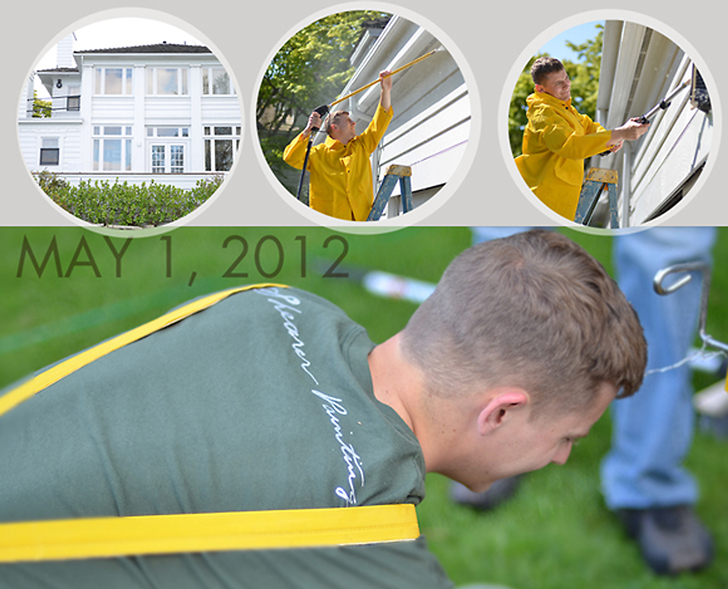 Pressure washing is the first critical step to get your house ready for painting. Not removing dirt from a wall greatly increases the likelihood that any coating you apply will fail sooner than it should. As it name implies, the pressure washer takes off dust, chalk, mildew, and old paint using highly pressurized water. Some washers are electric, while others are fueled by gas; the latter pack a bigger punch. They’re not difficult appliances to operate, but they can be dangerous in the hands of an unskilled user. When you buy them, tools like these come with manuals for a reason. Renting a pressure washer, on the other hand, comes with no such benefits. That means it’s crucial to ask a store employee to show you how to use the machine before you go home with it. There are, of course, some functions common to all pressure washers. They all have a spray nozzle, a knob that adjusts the water pressure, a pressure hose, and a spray gun and wand. The main challenge in learning the ropes is handling the nozzle and the pressurized water. Before the water even reaches the nozzle, however, it needs to be flowing at the proper rate. The typical garden hose has a half-inch diameter, which doesn’t permit this. To supply the washer, a hose with a diameter of 5/8 inch is best. It may seem obvious, but it bears mentioning: Don’t point the nozzle at people, including you. Pressure washers expel water so forcefully that they can seriously harm a person. As with regular guns, when you “fire” the gun of a pressure washer, there’s a considerable kickback. If your footing isn’t entirely stable — if you’re on a ladder, for example — you’ll need to compensate to make sure you don’t fall. Use common sense, and keep in mind that a certain amount of strength is involved in pressure washing. Another seeming no-brainer is worth remembering: Aim away from sources of electricity. Lights and meter boxes are typical elements to avoid when washing a house’s exterior. A washer’s most intense pressure setting rarely comes into play. Pressure washing demonstrates the principle that less can be more. A run-of-the-mill cleaning job might call for between 1500 and 1800 pounds per square inch (psi). This pressure level takes off spider webs, dust, and accumulated grit from air pollution, among other types of dirt. In conjunction with a cleaner, it can also eliminate fungus. Washing away loose paint may require a bit more force. Up to 2500 psi could be necessary. 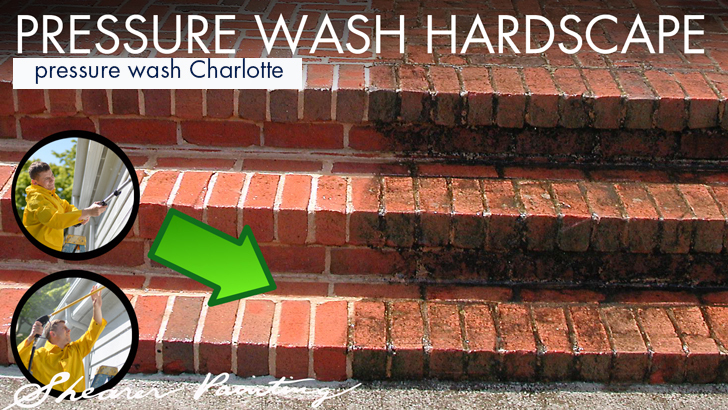 Unless you’re trying to remove a coating from masonry, a washer’s highest setting (usually 3000 psi) is overkill. Hitting a surface with that much force can harm it; wood siding is particularly vulnerable. Which Nozzle is Right for the Job at Hand? The nozzle you select significantly influences how the water hits the surface being cleaned. A wide fan is often best, but within that description there are still many nozzle types to choose from. On a pressure washers used by pros, a nozzle’s color usually indicates its fan width. Green, black, and yellow nozzles are the most versatile and helpful. A red nozzle represents no width (zero degrees), which means water comes out straight. This isn’t a nozzle to play around with; it can wreak havoc on exteriors. That said, high features like fascia boards and the underside of a roof’s overhang (i.e., soffits) may only be reachable via this nozzle. Yellow nozzles produce a 15-degree fan, which is still quite powerful. The spray can scrape paint when directed at a 45-degree angle to a surface. Green nozzles (25-degree fan) are the most widely used variety; they’re essentially medium-strength nozzles. Besides working on the outside of your home, you can get debris, dirt, and leaves off your sidewalk and driveway with a green nozzle. During pre-painting prep work, yellow and green nozzles are likely to serve you best. Compared to the nozzles listed above, white nozzles make the pressure washer a low-impact tool. Their 40-degree fan comes in handy for washing glass, cars, or any surface that demands TLC. Used with water, black nozzles don’t clean at all; they’re designed to spray chemicals combined with water — cleaning solutions, in other words. Their fan is wide and lower pressure than those produced by the other nozzles. Black nozzles do, however, perform a neat trick: They keep the water and chemicals well blended while you spray. As their name suggests, turbo nozzles are high-powered pieces of equipment. Like a red nozzle, a turbo shoots water straight ahead. Unlike a red, it also rotates the water circularly. Thus, it’s a compromise between the intensity of a red nozzle and the wider coverage of the other colors. Concrete is a fine material on which to use a turbo nozzle ; soft wood siding, not so much. The most important thing prior to pressure washing is to protect your house from the blast. Close windows and doors, and proceed gingerly when washing near leaky ones. Remove patio furniture and other items that the water (or flying debris from the surface) could harm, or that could be in your way as you wash. To this end, recruit a helper to make sure the hose doesn’t get stuck or tangled, and to ensure that things go smoothly in general. Water and electricity aren’t a good combination, so turn off the power, at the source, for any electrical element you may encounter while washing. If there’s a strong wind, consider postponing the job; the force of the pressurized water and the wind may be enough to knock you off a ladder. Even if the weather is perfect, be realistic about how strenuous pressure washing is, and give yourself a rest when you need one. When you begin washing, make sure the machine is set at a low pressure level, and that you’re using a nozzle that produces a wide fan (25 degrees is good; 15 is too narrow). You can always go tighter and more powerful if you need to. Wrecked surfaces, on the other hand, can be tough to fix, so play it safe. From 1500 psi you may need to step up to 2000, but you’re unlikely to require more than that. Washing should commence at the top of a wall. After all, you want to move dirt down vertical surfaces, not back into spots you’ve already washed. When working with siding, start with the nozzle a foot away. Safely moving closer requires lower pressure. Point down when you wash. Sending water up into lap siding can cause it to accumulate, which may eventually lead to peeling. You should also avoid hitting doors and windows with the stream. You don’t need to combine water with a chemical cleaner to pressure wash the grime off a surface. If you do include soap or another solution in the mix, make sure it’s eco-friendly, with a neutral pH. A cleaner like that will be low impact with regard to both the house’s exterior and nearby plants. However, you shouldn’t let it dry on the wall(s) you’re cleaning. While pressure washing is usually a top-down process, you’ll get the best results if you spray a cleaner on the bottom of a surface first, then work your way towards the top. This method gives the soap a chance to spend some time — ideally 10 minutes — tackling residue on the wall before it’s rinsed off. The pressure washer should not be set above 1500 psi if you’re using a cleaner. The 40-degree white nozzle works well for washing with soap. If you go that route, make sure the pressure setting suits the nozzle. If your washer is powered by gas, make sure the engine has enough oil. See that the pump is adequately lubricated (with non-detergent oil, 30 weight, or whatever kind the manual advises). Pick a nozzle and attach it. If it’s not firmly attached, it could fly off when you begin washing. Connect the hose that will supply the gun with water. Turn on the water. No one should be using the washing machine or dishwasher while you pressure wash, since these appliances reduce the level of water pressure you’ll receive. Expel any air trapped inside the pump or hose by pulling the washer’s trigger. You should see a consistent spray before you hit the “on” switch. Pull the trigger as far as it will go to avoid harming the pump. This is an especially important step when using gas-powered washers, which are more likely to hurt you if they aren’t started properly. Note: The steps listed above apply to painted siding. Working with stained wood siding, like cedar or T1-11, requires a somewhat different method. Funny how most of these articles, are written by people that have never painted a house. This article suggests 1500 psi is starting low. 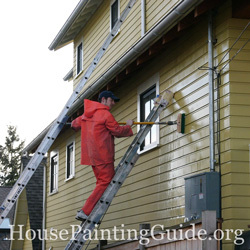 If your painting Rinse your home down with a pressure nozzle attached to the garden hose. Their way will be removing stucco along with airborne dirt. If you think its necessary have at it, but common sense and a little look see around the base of your home, will likely show where stucco popped off from a sprinkler. In extreme cases it may be necessary , but most times it causes more harm than good. Gently rinse the house……Power washers are great for concrete cleaning, test a hidden spot with 1500-2000 psi and notice how it etched your concrete…..done sporadically this will leave lines all over the place.Save your $ and time And rinse your house down a day before you paint. method.” So what’s the METHOD!!?? So frustrating for you to not have completed this!! This is some really good information about the pressure washer. What is the difference between polyurethanes and urethanes? What is the highest Gloss Paint?